Who would have thought that an abandoned Sports Authority building in Sherman Oaks could be turned into the most amazing display of Disney memorabilia this side of a D23 Expo? Richard and Nicholas Kraft dreamed it and did it with their That’s From Disneyland exhibition and auction in August 2018. 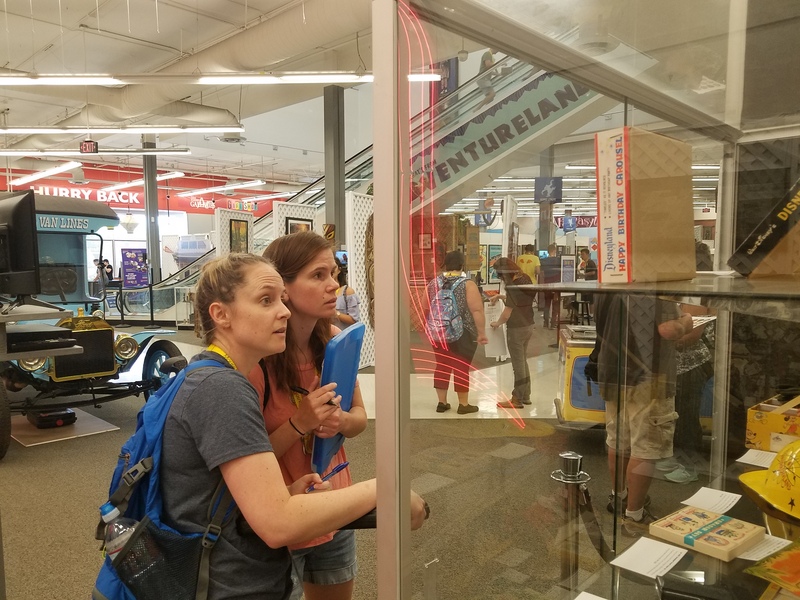 More than one thousand items, ranging in size from matchbooks, postcards, and small figures all the way up to the giant sea serpent from Submarine Voyage and a wide array of attraction vehicles, were on view and free to the public. When Nicholas contacted the Third Gate Games crew and asked “Could you write a MouseAdventure?” we did everything we could to make it happen. Held over the course of two consecutive weekend days, MouseAdventure That’s From Disneyland gave players exclusive access to the exhibit in the morning before the crowds were admitted. 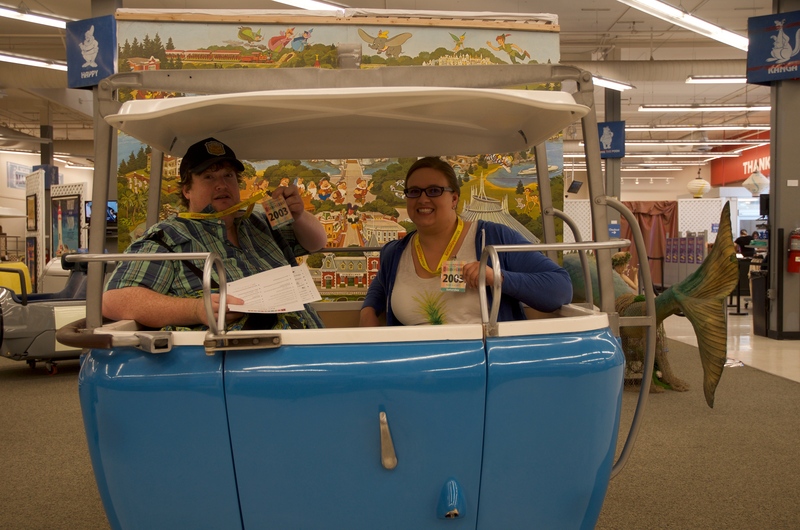 Teams weren’t just leisurely strolling through though, they had some quests to complete! Attention to detail was a must, as always. The final hour of each day was a challenge for teams as the public was admitted, creating more crowded conditions around some of the locations. Working directly with the Krafts and Van Eaton Gallery afforded the Third Gate Games team a unique opportunity to dictate what was on display for the game, thus eliminating the need for errata, and allowing us to tailor our quests more than usual. In addition, we were able to hold an interactive quest in the upstairs space that would have been difficult in a theme park setting. Several teams needed assistance on the operation of the decoder disc, and at least one team needed to be reminded to read the instructions carefully, as they had transcribed the text from left to right. 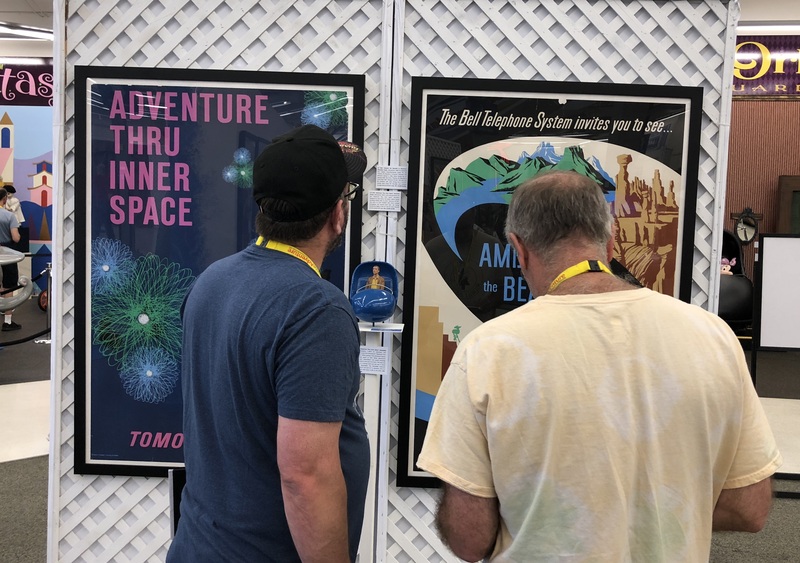 The first thing one of our writing crew noticed when we walked through the door of the exhibit was the Disneyland parking signs mounted on columns. This revelation lead to a quick sketch, and then a quest slowly started to form. By the end of the first day of writing, “No Bumping” was born. An aerial photograph of Disneyland from June 15, 1972 (auction item #57) located on the wall near the big Disneyland Hotel “D” showed the front area of Disneyland, including large portions of the parking lot. Teams used the parking stub to locate the area in the photo that corresponded to Flower, and then counted the number of cars in that section: 2. Although the aerial photograph was quite large and easy to find, the cars appeared small, proving a challenge for some teams. Once the exhibit opened to the public, this area became quite busy due to the popularity of photos with giant neon “D” from the Disneyland Hotel. Auction item #128, the control unit for the radio-controlled “Safari Adventure” boats at the Disneyland Hotel, was the key, revealing the other two words on the speed control handle. Several players pointed out that Drizella is actually the person trying on the slipper, but as the sign clearly stated Anastasia, this was the only acceptable answer. During the writing of this quest, we had a heated discussion about players not knowing which character was which, when Mike Van Eaton (the owner of the gallery responsible for staging the exhibit) walked over and picked up the blue sign that had fallen on its face, quickly resolving the debate. The instructions asked teams to write the name of the associated attraction as their final answer. Auction item #680 was a model of the ride vehicle for former Disneyland attraction, Adventure Thru Inner Space. With such an amazing array of ride vehicles, this quest was a treat to design. The first round of testing indicated that the quest was too easy when the photos were provided in color. When changed to black and white photos, it became more challenging. Eagle-eyed players located auction item #182, the 1962 map, containing the label “Friendly Indians” in the upper left quadrant. Flying above them, on the outside of the Disneyland railroad is a bird labeled: Golden Eagle. Walt Disney’s Disneyland would not be what it is today without the support of the many corporate sponsors over the years. This quest sent teams Seventeen different sponsors were represented in total. Images of a single letter from each item spelled out “Disney sponsorship” on the provided page, and teams searched high and low to locate them all on items from magazine-sized flyers all the way up to 3’ by 6’ posters. The small entrance lobby of the exhibit contained a bulletin board, where several of the items in the collection were featured on flyers. The particular flyer involved in this quest was looking for a lost dog, which was actually auction item #426, the Rivers of America Indian Settlement animatronic dog. 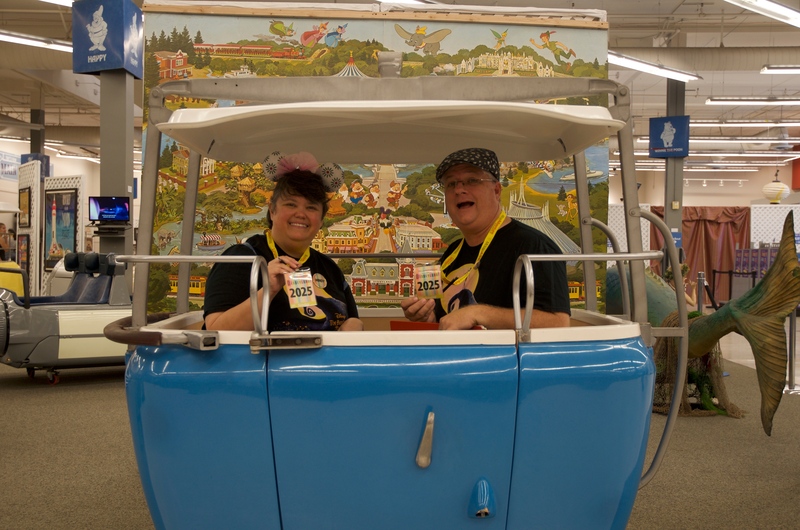 Being able to take pictures inside of the ride vehicles was an opportunity that we could not pass up. Teams were awarded points just for sitting in a Skyway bucket and smiling at the camera! All team photos are available for download from our online album. Instead of the usual photo vignettes, teams received text eye spy questions that could only be answered by locating specific items within the exhibit. One of the most challenging was the address of the Richard Rush Studios, Inc, which was located on the crate underneath the 1964 New York World’s Fair GE Progressland pavilion model. Teams headed upstairs to play a familiar game where one player draws things and the other player tries to guess. 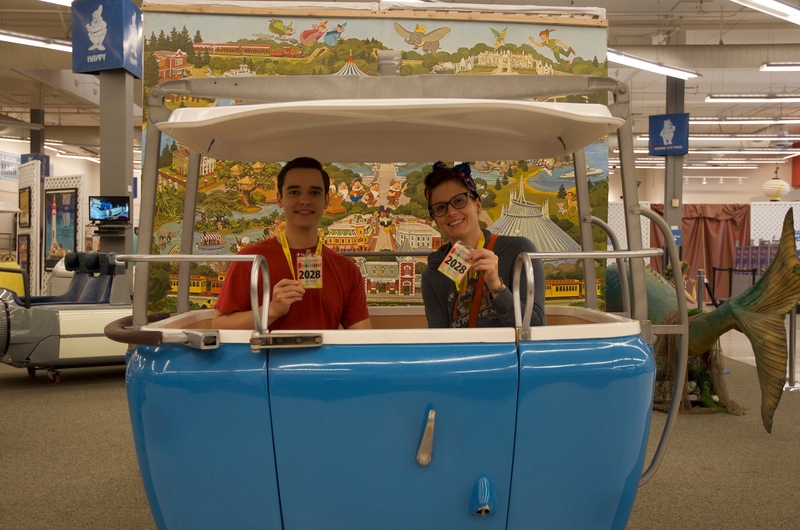 Keeping with the theme of the exhibit, all of the provided cards listed former Disneyland attractions, such as Midget Autopia, Rainbow Ridge Pack Mules, and Circlevision. Each team selected an artist who picked a packet of eleven cards. Teams had three and a half minutes to guess as many as possible. This quest was a fun break from the rough and tumble in the exhibit downstairs. On Saturday, the best new team (not otherwise placing) was Team 2028 with 370 points. On Sunday, the best new team (not otherwise placing) was Finding Temo with 373 points. You can view all of the candid event photos in our online galleries for Saturday and Sunday. Third Gate Games extends our profound thanks to Richard and Nicholas Kraft for inviting us to be a part of their month long exhibition. Writing the game was such an amazing honor, and just a whole heap of fun. Additional thanks to the Van Eaton Galleries team, who were an integral part of the game planning process. We would also like to thank our amazing volunteers, without whom we would not be able to stage these events: Aaron, Amanda, Janis, Jeffry, Lora, Shoshana, Steve & Tommy. Thank you (also!) to Shoshana for writing our trivia questions. Finally, a shoutout to the Golden Gate Ferry service for providing a nice stable trip across San Francisco Bay during game design.